While it’s every girl’s dream to have a jewellery box brimming with beautiful baubles, chances are that you would hardly wear most of the pieces that you have in there. However, a pair of statement earrings is an accessory that can get you ready in a jiffy, for literally any occasion. 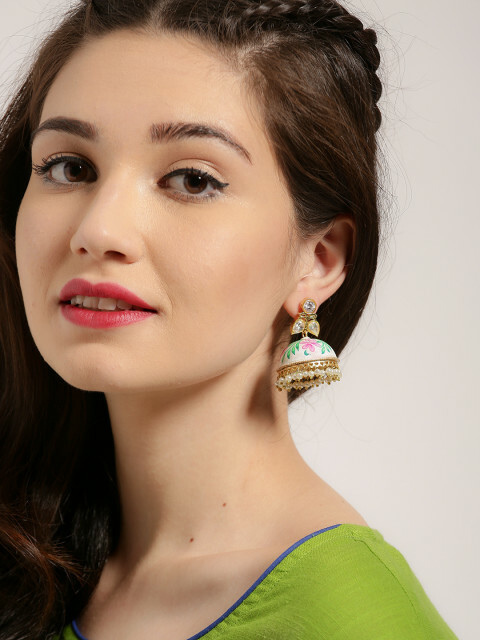 With festive season around the corner, having a few pairs of Indian Statement Earrings is totally a must have! 1. Jhumka: Who can do the festive season without a pair of lovely jhumkas! The delicate work and little dangling ghungroos make a total must-have pair of jhumkas. Good news is that now we have a zillion different options to choose from and one can find them all on Myntra! 2. Studs- Every woman needs at least one good pair of studs that she can slip on every day and one that will go well with a regular kurti as well as a party outfit. If you are the kind of person who likes Jewelry that hies with any and every look, then you must invest in a good pair of studs. 3. Tassel Earrings- A pair of chic pair of tassel earrings add another dimension to your look. The boho-chic vibe is just perfect when paired with a palazzo and long kurti to add a bit of fresh modern look to the look. 4. Chandbalis- These gorgeous earrings go well with every style and personality. Wear one of these and you don’t have to worry about any other accessory. They add to the richness of the Indian Outfit! 5. Chandelier Earrings- These beauties stands out for its sheer sophistication. A versatile piece of jewellery, these can be paired with ethnic as well as western styles, but it works like magic when paired with an anarkali suits or a designer saree. So my girls, just quickly go through your collection, check what you have and what needs to be added. Myntra has all the options available at one place to make things a bit easy for us! Such on your laptop, sit with a cup of coffee and have fun online shopping! We are one of the trusted and affordable packers and movers in Gwalior, provide reliable and cost-effective shifting solution at the reasonable price across the nation. Thanks for the information. Many look for Indian Fashion earrings online. For them fine world is an option to have amazing Indian jewelry.